Coffee & Nib-bles / Share your milestones! I think there was an old thread like this somewhere (maybe I even opened it ...) but I can't find it. SO ... what recent calligra-milestones have you reached? I'm proud to share my latest achievement: I can now listen to music WITH LYRICS while writing simple repetitive lines. YAY!! Before today, I made mistakes all the time when writing and listening to something with lyrics, so doing client work while listening was out of the question. But now ... ACHIEVEMENT UNLOCKED!! I found this: https://www.kindness.org/initiatives/75-leave-art-for-someone-to-find/acts, it's an initiative to leave art for random people to find, then tag and share it. What do you think? I'm definitely gonna join, it sounds like great fun to just brighten up a stranger's day. If you join too, let's post our submissions here as well! I hope this hasn't been posted before, but I found this gem and think it's quite hilarious. I wanted to share my newest find with you. The holy grail of cheap practice paper! So far, I've been practicing on HP Color Laserjet paper as recommended by Erica, but now I found something even better. It's see-through (60gsm), no feathering or bleeding and half the price of the HP paper. It's called Clairefontaine Smart Print Paper and is available in 50-80gsm, the 50gsm is 6€/500 pages. It's not as smooth as the HP paper, but I like a little tooth. Try it, I'm serious. It's so good. Sooo I've been wondering: Is there a way to erase on shiny, shimmery paper? I've tried and it dulls the shine and makes horrendous smears. Any experiences with that? I've got dark gray iridescent envelopes, so using a lightpad for guidelines is not an option. I've got a curious problem today, maybe one of you knows something about this. This summer, I purchased a penholder and recently it has started to smell really bad. It smells like a wet towel you've forgotten about and left crumpled in the corner for two weeks, if you know what I mean. Kinda mouldy, rotten, disgusting. I can't see anything but the smell is getting worse. I've cleaned the surface but the smell just clings. Is it possible that the wood is rotting inside or something like that? I'd really appreciate any kind of advice. Should I contact the person I bought it from? I'm a little embarrassed to be honest. I hope I'm not the first person with that weird experience. 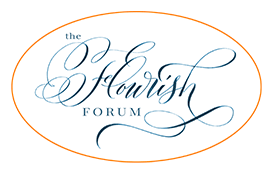 Open Flourish | General Discussion / Loose sheets or sketchbooks for practice? I'm curious– do you use loose sheets or notebooks for practice? I often think that I should keep my practice all together and only use a book, but I find it uncomfortable to write in notebooks since most don't open flat and you can't hold your hand properly because of the bulk they make. So I use all kinds of paper I can find. As some of you may know, some nail polishes have tiny metal balls in them to help stir it properly and efficiently. I've tried this with pigmented ink (like PearlEx) where the pigment settles quickly to the bottom of the jar, and it works like a charm. No more prying the layer of pigment off the bottom with a toothpick! So I thought I'd share this you can buy those balls off ebay or amazon easily. 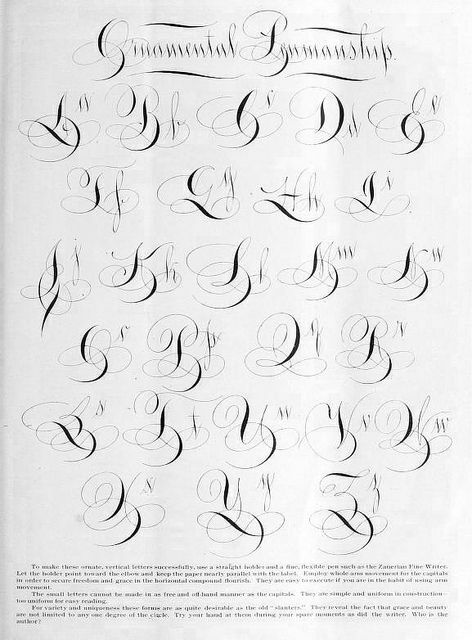 And I've been trying to find out more about vertical ornamental penmanship, to no avail. Since I would love to learn as much as I can about it, I thought I'd ask here if anyone knows anything about this, historically, or where I can find resources, specimens etc. Apparently there was a series in the Business Educator, but I am unable to find more than one page of it. History nerds, your turn! I have some beautiful colored Iron Gall ink from Rohrer & Klingner and I've been successfully using it with dip pens. However, I was wondering if it will kill my Parallel Pens, if I put it in there. Will it destroy the plastic and/or the nib? I'm guessing yes, since it's corrosive, but how long will it take to actually destroy the PP? If I have to buy a new one once a year or so, it'll be okay, but if it destroys it in a month, I'd rather use dip nibs. I hope someone can shed some light on that. Just imagine it hand-colored, the "Austria" calligraphed in our national colors red-white-red and printed on crown mill cardstock.